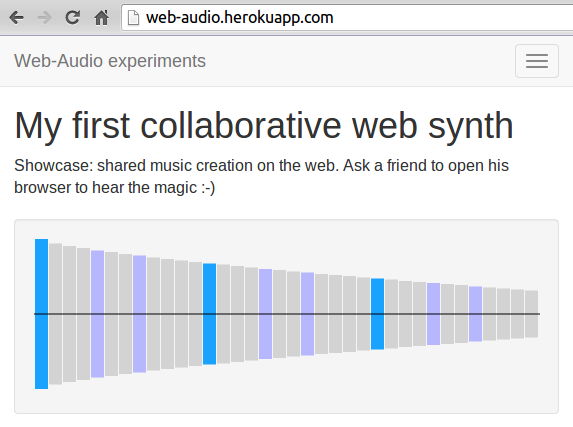 For me, being able to use advance audio programming on the web looks like a dream just a couple of weeks ago, and I'm not the only one for sure. Doing audio programming, I've mainly experienced with Max/MSP and Pd but my interest in shared music creation / consumption and interactive systems have long seems to demand the extension of this skill set; as Udi Oron rightly argued in "Hackita" two months ago: you have no chance to convince someone to download your desktop app (Max or Pd patches for example), give them a web app instead! As claimed before, no one downloads and install desktop application anymore unless it came from known source and the one that download it knows for sure that he wants to use it (as opposed to just trying things out). It's probably the easiest way to go if you want shared behavior and interaction between users of the system. Web standards are here to stay. You can be sure that organizations like Google, Mozilla, and Microsoft will compete to provide the best implementation possible. The API itself looks very promising. I hope that I will be able to summarize pros and cons soon. That's being said, here are my experiment with the API. If you are interesting in more information and tutorials be sure to take a look at the "Useful links" menu (top navigation bar). And as always, source code can be found at github.